At Hair Solved, our professional team of expert technicians and stylists know how distressing it can be for women who lose their hair. Whatever the cause of your hair loss we can provide the help and advice you need during a free consultation with one of our highly trained hair loss professionals. An experienced consultant will talk to you about your condition and how our Enhancer System can help you create a full head of beautiful, natural hair. Our innovative system is exclusive to Hair Solved and can add volume to thinning or patchy hair, or provide the perfect solution to total hair loss. Over many years of development, we have created a system that is light, durable, long lasting and secure and enables women to do all the things they love doing without worrying about their hair. And with our specialist salons located across the UK, our hair loss experts are accessible and on hand to help. Complete the form to find out how our expert team can help you find the solution to your hair loss with our Enhancer System and we will contact you to arrange a free consultation. Alternatively, you can visit our website or call us free on 08000 654501. Please quote ref HS2. 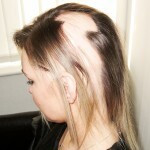 Is the Enhancer System suitable for all types of hair loss? Yes, it is suitable for all types of hair loss, no matter what the cause or condition. Every system is bespoke and designed specifically to suit your needs. This only happens after a through consultation discussing your condition and your desired look and style. Whatever the cause of your hair loss our unique and innovative system can cover total hair loss, partial loss or simply add volume to thinning hair.